It must be an absolute joy to train alongside Lionel Messi week in and week out, especially when the Barcelona icon produces moments like this. 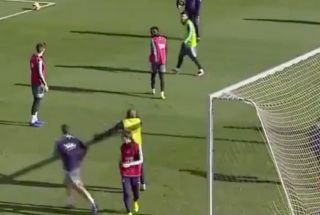 As seen in the video below, the Argentine international scored a superb goal in training on Friday as he took his attempt on first time and somehow guided the ball into the back of the net with a perfectly placed and weighted effort. It shouldn’t really come as much of a surprise that he’s capable of producing quality of this level, whether it’s on the pitch or otherwise. However, if you take a closer look at Gerard Pique’s reaction to the goal, it’s clear that he is still capable of leaving his teammates amazed. It’s a priceless reaction from the Barcelona defensive stalwart and he looks in utter shock over what he’s just seen, as he continues to stare at Messi in somewhat disbelief before dropping his head to the floor. The Catalan giants are back in action after the winter break when they take on Getafe on Sunday night, with the Barca faithful hopeful of seeing some more Messi magic to start 2019.